GCC spec vehicle with 8 cylinder engine, silver interior and automatic transmission. 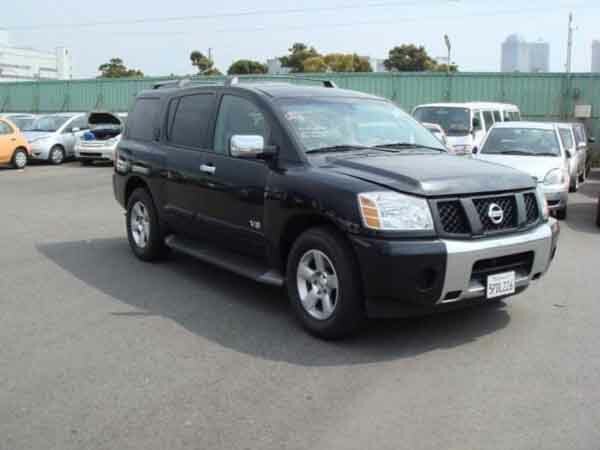 Automatic Nissan Armada with 20 inch wheels, sunroof, rear camera, grey/silver on the outside, other color interior. Reduced price! Grey/Silver Nissan Armada SL from 2017 with black interior. GCC spec 2017 Nissan Armada, 8 cylinders, grey/silver SUV/Crossover with black interior. It comes with fog lights and power locks. GCC spec automatic, 20 inch wheels, power windows, rear camera, black interior, grey/silver exterior. 8 cylinder white 2013 SUV/Crossover. Beige interior. Power windows, 21 inch wheels and parking sensor rear. Wassem - When I went to buy a second hand SUV I had two choices, either a Nissan or Chevrolet cars. I went with the Nissan as its price was better and parts are easier to find. The options are great inside even though its base trim and there is loads of space for my whole family. Pros: Space, style and options. Cons: Fuel economy and one engine available. Ayman - When I want to buy used Nissan Patrol in Dubai, UAE, it was easy to find one online at a reasonable price with no accidents. It may be an import pre owned SE, but it does exactly what I need it to do! Pros: Space, power and options. Cons: Parking in Dubai mall is a pain. Kurt - I bought a used Nissan Armada LE V8 5.6L LE for my wife and me to use for work purposes and to get the kids to and from school. I can’t think of a single vehicle that can do the same with these cars. The power, the luxury and the space it has inside is unrivalled by anything. Pros: Powerful motor and space. Cons: Handling is too soft. Its big nature isn’t just for show. Eight passengers can fit inside in comfort and with the rear two rows folded down, space to haul heavy loads increases to epic proportions. Only one engine may be available, but it’s incredibly powerful. 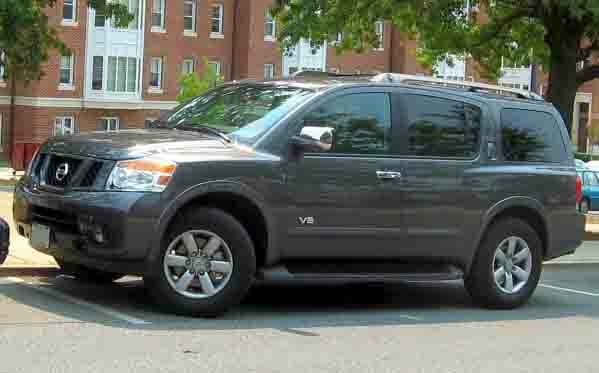 Finding someone to buy a used Nissan Armada for sale in Dubai, UAE is incredibly easy due to the brand's popularity. Selling it on the export market works well too. Due to Nissan’s reputation, finding spare parts across the UAE is relatively easy. In top trim, options are enough to rival a limousine. Debuting in the GCC in the mid-2000’s this monster of an SUV had enough room for eight people inside and for each of those eight people to bring at least one dog with them. This behemoth lined up as an alternative to the Patrol if that wasn’t big enough. The only thing more significant in Nissan’s lineup is the Rosa, Canter and Fuso. Rolling out in its first generation, if you saw this in your rear view mirror, it’s best to move out of the way as soon as possible before it runs you off the road. With a boxy shape, this SUV did exactly what it needed to do. Take the kids to school in comfort and safety and on the weekend carve through the desert while hitched up to four quad bikes on a trailer. Up to eight passengers can fit inside with base models being packed with a stereo system, fabric seats, powered accessories, manual seats and steering wheel. Higher trim levels receive leather seats. Premium BOSE sound system, infotainment system with navigation, media options, Bluetooth and internal storage device, media inputs and memory seats. Rear passengers are kept busy by the flip down TV screen complete with DVD player and inputs. Base models exterior consists of bulb front and rear lights and a trailer coupling, as well as a square body whereas optional extras which are available on higher trims such as roof rails, reverse camera, parking sensors, larger 20-inch rims and adaptive headlights, are attached. In 2008, the massive four-wheel drive machine received an overhaul to both the interior and exterior. Returning with a boxy exterior, a new front end is attached to a smaller front grille and front air intake. The cabin received new materials and features such as keyless go. Powering either the rear wheels or all four of them is a single 5.6-litre V8 petrol engine mated to a five-speed automatic. No manual transmission was made available. During the mid-cycle refresh, the engine and other mechanical parts were enhanced to provide better reliability, power and fuel economy. In 2014 another minor refurbishment took place, altering the interior door panels and other small changes. 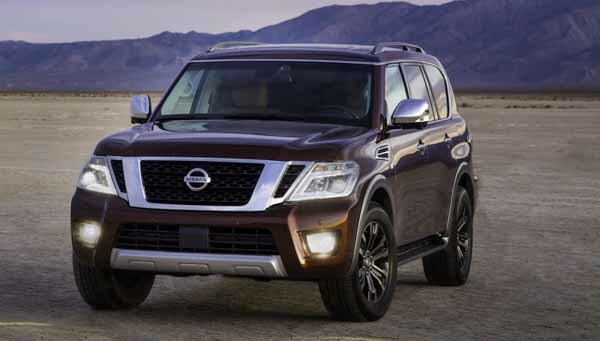 Entering its second generation, the Nissan Armada is said to roll around in Nissan Patrol disguise in countries that didn’t previously have the Patrol in their fleet which leaves the two and a half tonne beast in an interesting situation in the UAE market. Will we to get the Patrol looking Armada or will there be no 2017 spec version here. With an all-new appearance, the new Armada shrinks in size but can still hold up to eight passengers. We expect all the features of the Patrol to transition across and breath new life into the SUV. They may appear to look identical to the Patrol, however, upon further inspection, there is a lot more than meets the eye. The front grille follows in the footsteps of the 2017 Nissan Titan which is also an American exclusive, the headlights are similar, the front bumper protrudes out further as does the rear bumper. The vehicles base is also painted in a contrasting colour. There are also two new paint schemes: Forged Copper and Hermosa Blue. Inside, it's oddly familiar as the only with all the features of the Patrol available apart from the fridge mound in the centre console and the side air conditioning vents sport a new design. As for the engine, the 5.6-litre V8 is expected to power all four wheels while mated to an automatic gearbox or a manual transmission. The engine is said to be rated at 10 horsepower less than the Patrol and the drive mode selector only offers 4 high, 4 Low and Snow setups. We’ll have to wait and see what comes of the Nissan Armada in the GCC regions.